How do you shop for groceries? Do you run to the store every few days to buy things you ran out of, or do you shop once a week with a list, making meals according to a plan? Are you an impulse shopper, or do you always carry a list with organized coupons? Here are the basics you need to save money and time, and make your life easier in the hunt for food. Grocery stores are designed to keep you in the store as long as possible. All 'essential' items (milk, bread, produce) are located on the extreme corners of the store, so you have to pass by lots of other tempting merchandise even if you're just running in for a quart of milk. The most expensive products are placed at eye level (except for kid's products, which are placed at their eye level). Products on display at the end of aisles are usually not on sale or a special buy. Once you know these details you can plan your shopping list according to store layout, and save time and money by avoiding impulse buys. Before you even go to the store, you need to make a plan. I start by looking through supermarket fliers, internet offers, and newspaper coupons to see what's on sale this week. If frozen chicken breasts, for instance, are two bags for a dollar, I'll plan some meals starting with chicken. Go through your favorite web sites and cookbooks and plan 3-4 days of meals. Use this plan to make a list of items you'll need at the store. For an example, see this shopping list I developed for a weekend's worth of meals. Look through your pantry, freezer and refrigerator and note the ingredients you already have that fit into your meal plan. This is a good time to start keeping track of staples in your pantry and freezer. Attach a notebook to your pantry or freezer and make a list of items as you use them up. Check the lists before you shop and you'll never unexpectedly run out of anything. Make your list according to the store's layout. Fruits and veggies are at the top of the list because that's the first department in the store. Frozen and bakery items are at the end because those are the last departments before the checkout counters. Now let's organize coupons! I have a small expandable folder that's organized into sections for different food types. Each week I go through newspaper fliers and supermarket inserts, along with internet coupons and magazines and clip coupons for things I know I'll use. Make sure the expiration date is current. Coupons won't save you money if you buy a product you won't use, or if the brand name product you buy is more expensive than a generic product. Try not to shop when you're hungry, tired, or rushed. I know that's difficult, but it will make a big difference in your shopping experience, ending with you saving more money. If it's possible to go shopping without your kids, do it! Remember, stores are designed to attract impulse shoppers, which of course all kids are. When you get to the store, look for fliers near the door that offer special buys or one day only sales, and add them to your list if they fit in your plan or if they are easily stored. At the produce aisle, avoid prepared fruits and vegetables if you're trying to save money. These 'value-added' products are usually quite expensive, and I don't think they are as fresh as whole produce. Take a look at How to Prepare Fruits and Vegetables for tips on purchasing and storing produce. As you shop and go through your list, make sure that the products you buy match up to the stipulations on your coupons. Compare prices constantly. You may find that even with a coupon, name brand products are more expensive than generic products. If you haven't tried generic products, please do! They are the same quality as the more expensive name brands, usually packed by the same packer, and are less expensive because no advertising costs are built into the price. Most grocery stores now have unit prices posted on the shelves; that's the price per ounce or piece. Study these to find the best buy for your money. Check use-by and sell-by dates on every packaged product and buy the product with the latest date. Be sure that seals are secure, that cans aren't dented or leaking, and that packaging is not ripped, torn, or missing. If the store is out of an advertised special, ask for a rain check. The check will be mailed to you when the product is restocked, so you'll be able to get the sale price even if the rain check arrives weeks later. Always keep food safety in mind when you're shopping. I double bag fresh meats and seafood to avoid cross-contamination with fresh produce. Don't put raw foods that need cooking on top of food that are eaten as is. 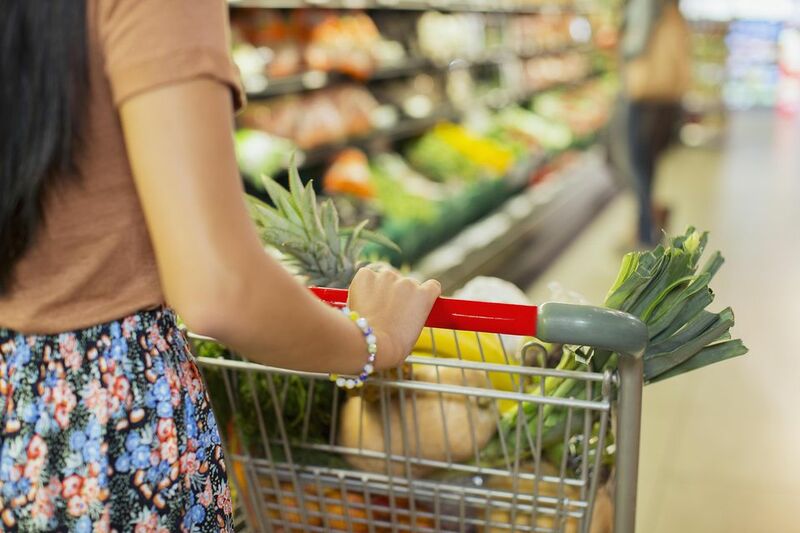 Try to plan your shopping trip so cold foods are some of the last items you put in your cart so they stay chilled all the way home. At the checkout counter, don't fall prey to impulse buys! Since you usually have to wait here, stores stock the most tempting items; candy bars, batteries, magazines, and odds and ends. Keep an eye on the scanner to make sure the prices you are being charged are correct, and remember to hand the clerk your coupons! When you're done shopping, go straight home and get all of that food into the fridge and freezer as soon as possible. Remember, cold foods can be left at room temperature for only two hours (one hour if it's really hot outside) for safety reasons. Enjoy the feeling of satisfaction you'll get looking at your well stocked fridge and pantry, then put up your feet and relax after a job well done!